Here’s an article I recently did for Drum magazine. These exercises really work! And for all you non-drummers, this concept of training is excellent to adapt to whatever your athletic endeavor might be. Just create custom movements with light dumbbells that emulate the various motions you perform. Runners, fighters, and football players all have key weightlifting exercises designed to strengthen movements specific to their activities. Drummers should have the same, so I’ve developed a few drumming-specific exercises through the years that will improve power, speed, endurance and mobility around the kit. I call this “Drumbell” training because it involves using dumbbells to enhance drumming motions. Try adding these to your regimen two or three times a week, and be prepared for some great results. A) Start off with really light “housewife weight” dumbbells; one or two-pounders should be fine. You can increase the weight later, once you get acclimated to the movements. B) Exercises are always performed in a rhythmic, RLRL motion, similar to drumming. C) Sets are based around duration of time, as opposed to traditional reps.
D) Perform these exercises at the end of your upper-body workout routine. This exercise will bring super power and endurance to your snare drum strokes. 2. Raise your right dumbbell up to the right side of your head, approximately four inches from your temple. 3. With a controlled motion, return the right dumbbell to your starting position, while simultaneously raising your left dumbbell up to the left side of your head the same way. 4. 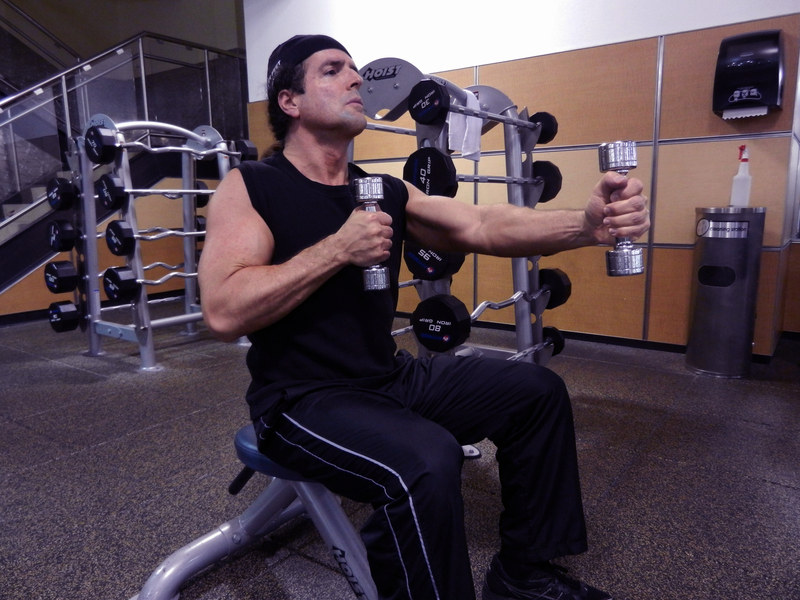 As you return your left dumbbell to the starting position, raise your right dumbbell back up again, and so forth. Continue this RLRL motion for 30 seconds to two minutes. Do three sets. This exercise will increase mobility, speed and power between your toms and snare. 1. 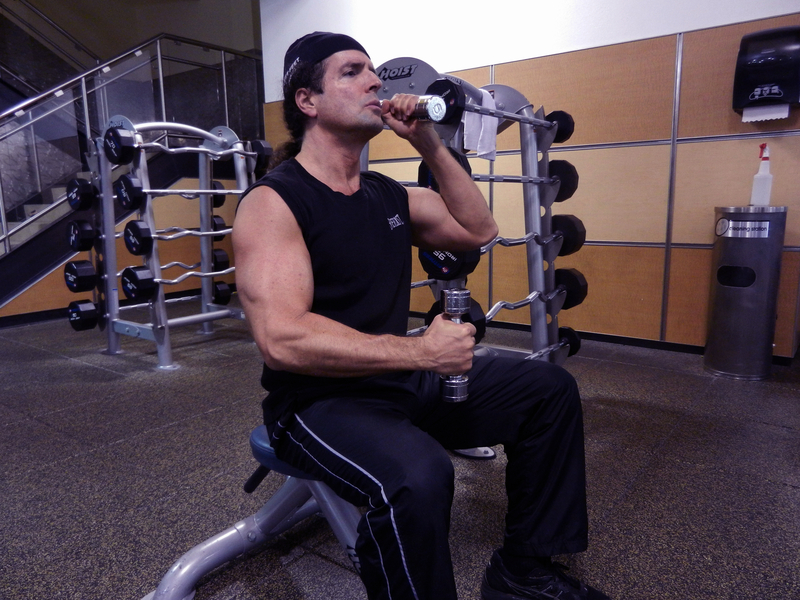 From a seated position, hold both dumbbells in front of your chest, with the sides of your fists facing down. 2. 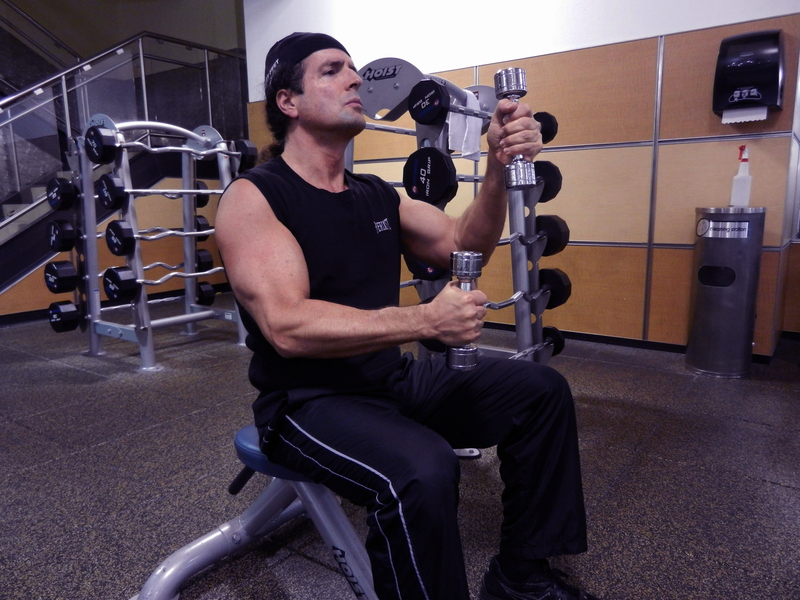 Extend your right dumbbell forward in a controlled, circular motion. 4. Continue this motion smooth and steady for 30 seconds to two minutes. Do three sets. Both of these movements should produce a gradually intensifying burn in your arms and shoulders, so embrace the pain! This entry was posted in Exercise and tagged bobby rock, Drum magazine, drummers, drumming, rock-solid fitness, weight training. Bookmark the permalink.